Thanks for the fast shipment! I use shea butter on my eczema and it does the trick even better than what the doctor prescribed. Amazing. 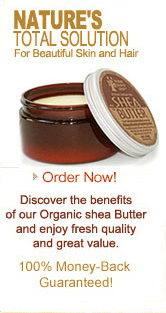 Thank you for providing organic, raw shea butter. I received the order yesterday. It arrived very quickly. The shea butter is wonderful! I am highly impressed with the quality. Thank you so much! Your Shea Butter is awesome! My first purchase is almost finished so I just bought another. I never had a problem with dry skin until I moved to Québec. Nothing worked until I tried your Shea, my skin is soft again and it even works on mosquito bites. I swell up real bad, but I use your Shea and not only does it relieve the itchiness, but I don't even swell anymore. Awesome product and awesome customer service. Hi. I just wanted to let you know that I received the shea butter. It's wonderful. Thanks so much! Have a wonderful week. Wow, my order came really fast. This stuff is amazing! I love applying it to my face, even under makeup. =) I plan on using this during my pregnancy as well. Thanks so much for your quality products. 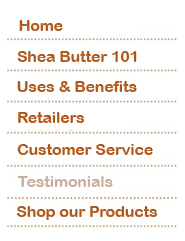 I absolutely love all the products however the 4 oz Shea Butter is my favorite. I use it daily and carry it everywhere I go. My hands and my skin hasn't been this soft for a very long time. Love your product. It is the best i've ever used. WOW! 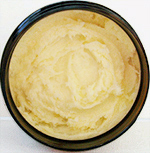 I am absolutely delighted about the results we have seen from using your organic shea butter. My son has suffered form excema and dry skin since he was about 2 months old. We have tried EVERYTHING including cortisone creams and many other moisturizing creams. He had such dry skin on his fingers that his skin would crack open. Since using your cream about three times a day his skin is beautiful! I haven't used anything else and his hands are healed. It's amazing. I am also using the shea butter on myself and it is the best thing I have ever used. I love that it is all natural and am currently using it on my newborn daughter. No more harsh creams filled with chemicals for us! Thank you so much for making a great product! I think your product is great! I have bought some for my little granddaughter who has an allergic reaction. I use it myself for lips, burns, cuts etc. I am really pleased to have found such a natural but effective balm. I am impressed with the prompt delivery. I placed my order on Friday and received it on Monday. I am looking forward to using your product. I already love the texture and it does not have a foul order like some shea butter i have used in the past. So far I have to say I love it!! I adore your shea butter. Your products are absolutely superb. I will be ordering more and more. I'm a repeat customer and recently bought your new Grapefruit Shea butter. Just wanted to let you know how much I like it. It is definitely my new favorite! This stuff is really amazing and also great customer service. I bought your products for my baby. She has baby eczema and I've been using your Shea Butter on her 3 times a day and now its almost gone. I highly recommend it to anyone especially those with sensitive skin. I received my Shea butter today. Wow, was I surprised at the creaminess of it. It is the best thing that I have EVER applied to my skin. I began using organic shea butter during my third month of pregnancy when it was recommended by a close friend and have never used anything but this great product. I have absolutely no stretch marks and my daughter has never had a problem with diaper rash. I will continue to use this product and recommend it to every mom or mom to be I meet. Thanks for the great products.